The long-dreaded war between Britain and France has finally begun. French soldiers have landed on English soil and the British Army – and the Royal Sorcerers Corps, led by Lady Gwen – is moving to meet them. But when an inexperienced major disobeys her orders and sends two hundred hussars to their deaths, Gwen accidentally uses her magic to permanently damage his mind and sparks a political crisis at the worst possible time. In the aftermath of the battle, Lord Mycroft suggests she leave Britain and head to the North American colonies, where British forces are anxiously awaiting a French offensive. The local sorcerers have been poisoned, the local government is barely keeping the colonies under control, the slaves are mutinous and revolution against the crown is brewing. The few locals with any known magical talent are untrained and certainly not ready for combat, but – if they can be trained in time – they may be all that stands between the colonies and defeat. In Sons of Liberty, Gwen is sent from the relative safety of London to the colonies, where an undercurrent of revolution still abounds and intrigue and espionage are essential to keep the enemy at bay. But who exactly is the enemy? In the latest book in this exciting alternative history series, Christopher Nuttall expands Gwen’s horizons beyond Europe into the New World. Download a FREE SAMPLE, then purchase the complete novel from the links on this page! And please feel free to share this post. It’s been a very frustrating week. As some of you know, my wife and I are in the process of buying a house. Said house is complete, save for one minor issue that could be handled easily, if we could just cut through the red tape and get on with it. We were supposed to get the keys to the house tomorrow – more realistically, Monday – but we are basically in limbo until we get that issue handled. So we don’t know when we will be moving in and we have to vacate our current house at the end of May. To add to these woes, my son’s swimming lessons have been cancelled until the problems with the swimming pool are fixed. We’ve tried taking him to one public swimming pool, but it’s really too cold for a baby. And neither of us are particularly healthy. 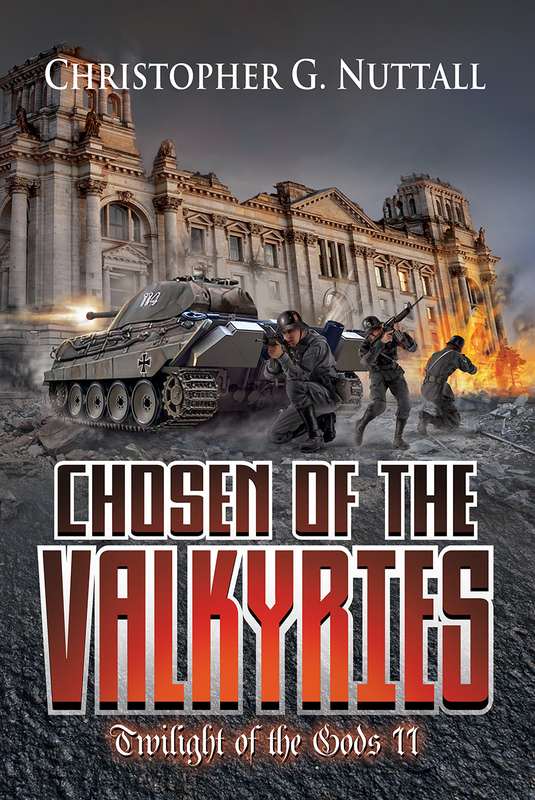 The long and short of it is that my current project, Chosen of the Valkyries, has been delayed quite badly. (I was actually behind with my editing too, which is another cause for discontent.) I’m hoping to finish the manuscript tomorrow, but with the way we’re both feeling … well, I can only hope. There will also be a number of other audio books coming out in the near future. Watch this space. So I’ve been tossing the following idea around, but I’m really unsure what to actually do with it. Basically, Earth got into a war with a more powerful alien race and lost. Think France in 1940 – the main body of the fleet is destroyed or hopelessly out of place, the government is paralysed, panic is spreading … matters are largely hopeless, as there’s no hope of assistance from the other interstellar powers. So the government sues for peace and gets something along the same lines as Vichy; Earth isn’t permitted a large navy, parts of Earth’s economy are turned over to service the new masters, a number of humans are expected to serve in the alien forces and Earth’s outside policy will be dictated by the aliens. The government isn’t happy about these terms, but it doesn’t see any option apart from accepting them. As martial law was declared when the war began, they can squash any opposition (riots or protests) or simply ignore it (outraged blog posts, letters to the editor, etc.) The government does its best to sell the peace terms to the public as a good thing; Earth will not only survive, but prospect in the new galactic order. They’re not entirely wrong. The aliens aren’t interested in stopping human economic development, so human products are still sold on the galactic market. They’re also willing to help upgrade Earth’s technology to some extent, although they’re wary of giving the humans something that can be turned into a weapon. But they’re not willing to give humans significant independence. Basically, when they bother to intervene, what they say goes. A number of human spacers didn’t agree with the decision to surrender and, in the confusion following the decisive battle, they took a task force or two of starships and basically vanished. They got some support from grey colonies, perhaps from a couple of interstellar powers that fear just what will happen if humanity’s new masters come for them next. But they don’t have the logistics chain to keep their ships running indefinitely, while they don’t have the firepower to pose a major threat to the aliens. And they are also hunted – if not very enthusiastically – by the post-war government. I’m not actually sure where to go from here. My original idea (the first time I wrote this idea up as a novel) was that humanity would receive a significant level of support from one of the other interstellar powers, perhaps one that wanted humanity’s masters to take a fall. This eventually got a little tangled, as humanity had very little free agency in that scenario. I eventually ended up with the new aliens being humans from the future, which was not a very good solution. A revised idea might be the human resistance eventually taking control of a star system or two and daring the occupiers to oust them. Perhaps, if the collaborator government couldn’t handle it, they’d need help – and that help would lose, particularly if everything humanity made during the occupation was dual-use – i.e. could be used for both peaceful and military purposes. If the aliens figured that resuming the war would be far too costly – perhaps because they’re occupied with threats along the border too – they might decide to pull back and abandon the liberated star system. Problem is – I can’t think of any time in human history where that has actually happened, unless you count Afghanistan in the 1800s. Maybe if the occupiers were traders, rather than warmongers. They launched the war to remove a potential threat, but they are concerned about the bottom line rather than ideology or pride they might decide to cut their losses and back off. Could be that they have a set of rules for dealing with other races and outright genocide isn’t allowed, or they fear the costs of starting a genocidal war. Another possibility in this situation is a second alien race moving in to support the resistance – the US supporting Taiwan – but again, I don’t think that has actually happened in the middle of a war. Of course, the threat of outside intervention might be enough to convince the occupiers to back off – or decide they’d sooner have a buffer between themselves and another interstellar power. A long-term solution – but perhaps not very dramatic – is a slow human takeover of the occupier empire. If human products are cheaper, if human innovation improves upon occupier technology, humanity might slowly start rising to a position of real power. Think Japan in the 1980s – all the fears that the Japanese were halfway to taking over the US because Japanese exports were dominating the market. All overblown, true, but might something happen if humans start pushing alien factories out of the market? But then, it would have to be a very foolish alien empire that would allow themselves to be subverted like that. There would be no hope of hiding what had actually happened. I may go for the middle option, myself. <grin>. 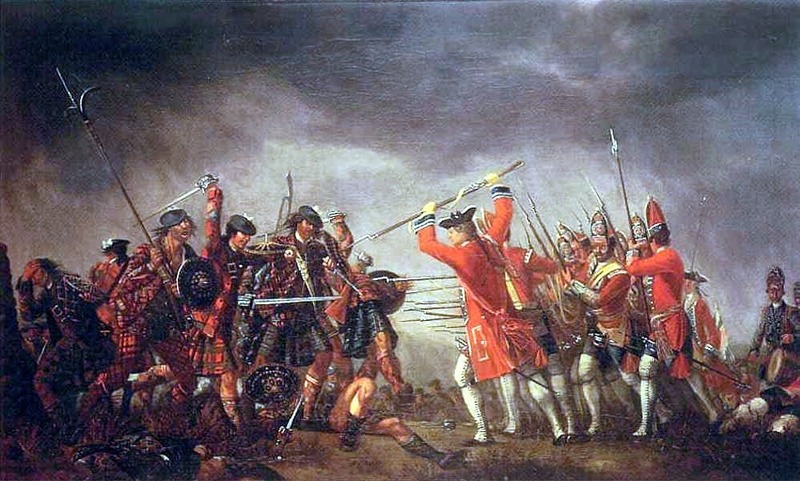 The Battle of Culloden is, like Midway, often considered a decisive battle. And, like Midway, the outcome of the battle is essentially immaterial. Just as a Japanese victory at Midway would not have altered the outcome of the Second World War to any great extent, a Jacobite victory at Culloden would not have kept the Jacobites from being ruthlessly destroyed by the Hanoverian Government. The balance of power was just too strongly against the Jacobites. It is for this reason, I suspect, that alternate historians have rarely paid much attention to Culloden. Indeed, if we are looking for plausible points of divergence that have a lasting effect, we are forced to peer back at the Council of Derby, when the Jacobite Army made the decision to withdraw from England. It was a disaster that ‘Bonnie Prince Charlie’ brought upon himself; he’d made promises, to the highlanders, that he was simply unable to keep. There had been no mass uprising of English Jacobites, nor had the French landed in sufficient force to support the highlanders as they marched on London. Their leaders – excepting the Prince – believed that they had done all they could and so they decided to retreat, with or without their nominal leader. Were they right? It is a decision that has been hotly debated. The Jacobites had been largely undefeated in the field, but could that last if they marched on London? Taking an entire city would be a nightmare, particularly given their shortage of heavy guns. And yet, panic had already started to settle into London. Would King George flee if challenged? Would Parliament offer to welcome Prince Charles to save the city? There are simply too many imponderables, but – as one historian noted – continuing the advance gave Charles the only real hope he had of survival and eventual victory. Retreating merely gave his enemies a chance to gather their strength and launch a counterattack. But what does Culloden itself offer for alternate histories? A Jacobite victory would certainly upset Cumberland – assuming he survived the battle – but I doubt it would stop the slow collapse of the Jacobite cause. Certainly, it might win time for the French to send help, yet I feel it is unlikely that such help could arrive in enough force to save the Jacobites from destruction. It’s much more likely that the Hanoverians would merely keep building up their forces and eventually crush the Jacobites by sheer weight of numbers. A negotiated surrender is another possibility, although Charles was highly unlikely to consent to surrendering anything. (Not, at this point, that he was the most popular man amongst the Jacobites.) It’s possible that his commanders would seize him and take him prisoner (particularly if they realise just how poorly Culloden is likely to go for them) and then try to open talks with Cumberland. It’s impossible to say just how Cumberland would react, if the Jacobites offered to hand over the Prince, but he might just agree to quietly let a number of prominent Jacobites slip into exile. Charles himself would end his days at the gallows, I imagine. The French would have no reason to bargain for his life. Not fighting the battle at all might give Charles a chance to pick a fight under far more favourable conditions. (Culloden itself was so poorly suited to the Jacobites that anti-Charles writers suggested he deliberately sent his army into a trap.) 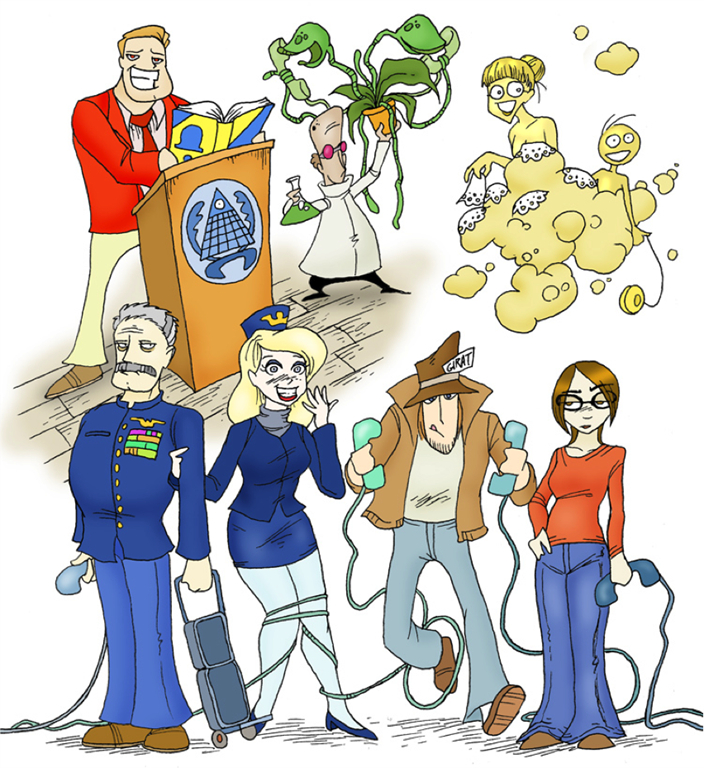 Yet where could this hypothetical battle be fought – and what effect would it have? An alternate outcome might just include a scattering into the heather, allowing a guerrilla war to be mounted against the Hanoverians, but it is unlikely to last long. There were just too many highland clans who supported the government for a small-scale war to last indefinitely. The Highland Clearances would be just more brutal in this timeline. Indeed, the most interesting outcome is Charles himself being killed during the fighting and his body found after the battle was over. Charles, in his later life, was a pig-headed wife-beating drunkard whose descent into near-madness (prompted, at least in part, by betrayal from his father, his brother and his wife) did untold harm to the Jacobite Cause. His brother might have outlasted Charles by several years, but the Cause itself effectively died with Charles. What if Charles had died earlier, at the peak of his achievements? Prince Henry would probably assume the title, for what little it was worth. Henry was a more careful person than Charles, but he had his problems. He would become ordained after the Jacobite Rising, something that badly undermined the Jacobites. (For once, Charles’s fury at his brother was not unjustified.) It is strongly suspected he was also homosexual, although there is no solid proof either way. It is quite possible that he was asexual, as he was reluctant to marry (even though quite a few homosexuals were happy to marry women at the time). He did not cut the dashing figure of his elder brother, but could he have revitalised the Jacobite Cause? There, we must speculate. Would he have been better at getting help out of the French? Could he have avoided Charles’s mistake of believing that everyone was either with him or against him? Or would he have retreated in horror from the title and hurried to hide in the Vatican? Culloden is significant, historically speaking, because it was the end of the last significant armed challenge to the British Government. A tradition that included such luminaries as Wat Tyler and Oliver Cromwell died with Prince Charles. If this is good or bad depends, I suspect, on your point of view. Political stability is often a good thing – our banking sector relies on our stability – yet the threat of revolution tends to keep the government from growing overconfident. And yet we should probably be grateful that ‘Bonnie’ Prince Charlie failed in his bid for the throne. A victorious Charles, as I have noted before, might not have been a better monarch than George II and III. Certainly, both kings had their problems – there was a profound streak of instability in George III – but neither of them was as petty and self-centred as Charles in his later years. It is quite likely that Charles would have eventually been packed off the throne and back into exile, after reminding everyone why his grandfather was forced to flee for his life. Nor was the destruction of the highland way of life entirely a bad thing, although it has often been called a genocide. The romanticised vision of the clans bears very little resemblance to reality. Many of the ‘chiefs’ were really little more than thugs, looting and bullying their clansmen mercilessly (quite a few of the soldiers who fought for Charles were effectively conscripts). One may argue, as many have done, that the Highland Clearances were nowhere near as bad as they’re painted. And, at the end, there were no large-scale reprisals after previous Jacobite rebellions. One must wonder at the sanity of those who expected the government not to take brutal revenge after a rebellion that came far too close to London. In winning the war, in securing its grip on Britain, the Hanoverian Government laid the groundwork for what would become the British Empire. It is hard – indeed impossible – to believe that a Jacobite victory would have been anything like as effective – or that a Jacobite victory at Culloden would have made much difference in the long run. Good news first – I now have a contract for Angel In The Whirlwind III and IV – currently titled Unlucky and The Hammer of God. For various reasons, I didn’t intend a limited series when I designed the overall outline, but The Hammer of God brings the first story arc to a close. There will also be another MIL-SF book from 47 North, due date August 2017. I’m currently learning towards Future Shock as the title. Sons of Liberty, the fourth book in The Royal Sorceress, is currently available for pre-order through the links on this page. As yet, I don’t have a sampler up, but one will be available when the book itself goes online. Therefore, my current schedule is Chosen of the Valkyries (April), Past Tense (May), Fear God and Dread Naught (June) and Unlucky (July). The downside, as I may have mentioned, is that we are supposed to be moving house midway through May. I didn’t realise just how complex moving house actually is – I have far too many books to make it an easy task, but I can’t bear to get rid of any of them. Obviously, sorting out any little mishaps that might happen will delay production. Unfortunately, there have been a handful of problems with the book sale. While I managed to get most of the books off (two parcels are left until I can get to the PO, which may be a few days off), I managed to mix up a couple of orders. One buyer wanted a signed set and got an unsigned set, which presumably means that the buyer who wanted the unsigned set got the signed set. I hope there weren’t any other mistakes, but I was in a hurry to get as many of my copies out of the house as possible and … well, accidents happened. If you got an unsigned book when you wanted a signed book (or vice versa) please let me know and I will attempt to replace the unwanted copies when I have more books in stock. This will not, however, be until August at the very earliest. I’m currently planning to order replacements for my stocks after I return from Malaysia, but this tends to take time. I’m sorry about the hassle. Hopefully, things will go smoother once we are in the new house. There is little I can say about Vol. 2 of this masterwork that I haven’t already said about Vol. 1. This is both an elaborate takedown of one of the most absurd series of books in the world and an excellent primer on what to avoid in writing. If you want to be a writer, read this book – and learn from it. Perhaps the most interesting – and horrifying – part of the book covers the growing relationship between Buck Williams (the so-called Greatest Investigative Reporter of All Time (GIRAT) and Chloe Steele. Actually, calling it a ‘relationship’ is rather absurd – Buck comes across as a stalker, a far more creepy version of Edward Cullen. But when Bella’s father worries about Bella, Rayford seems inclined to push his daughter into Buck’s arms … even though I suspect that any self-respecting father would be seriously worried about a guy whose behaviour is staggeringly inappropriate. And yes, it is inappropriate. The book goes on to discuss the growing absurdity of the antichrist’s rise to power. Precisely why anyone would pay attention to a Romanian politician after the Rapture is never really answered, but as the Rapture took place without the characters noticing … well, maybe it’s all part of his spell. Except even that tends to take away the sense of free will. Indeed, the only people who resist the antichrist are Buck – who has just converted to Real True Christianity – and – oddly – the power-broker behind the antichrist. (And here Fred offers thoughts on why that may be so, thoughts that far outshine anything you see from the authors.) Just why anyone would embrace the antichrist is beyond me – and it is beyond the authors too, because they offer no explanation. It is merely a done deal for them. Bad theology or bad writing? Personally, I’d bet on the latter. But there is one point where I feel compelled to disagree with Fred and it’s on the subject of peace. Fred points out, repeatedly, that there are strong factions that are instinctively suspicious of anyone promising peace. He’s right – but I think he misunderstands the reasoning behind it. The problem with ‘peace’ is that it isn’t ‘freedom.’ There are plenty of places in the world – North Korea, for example – which may fairly claim to be at peace, but would you want to live there? Peace is merely the absence of war! There is no shortage of people who will offer peace in exchange for servitude. In the years before World War Two, the West – Britain and France – made a number of concessions to Hitler and the Third Reich, all in the name of peace. There were elaborate justifications for giving up territory, ending arms limits, throwing innocent civilians under the bus … All that happened was that Hitler grew stronger and his demands grew more and more unpleasant. By the time France and Britain finally went to war in 1939, the Nazi beast was simply too powerful to be slain easily. Would the world have been a better place if Hitler had been stopped in 1936? We have not learned these lessons. President Obama’s much-touted deal with Iran has already proved itself not to worth the paper it is written on. Iran has merely grown stronger; it already has more demands. And, while Fred condemns the reluctance to make peace in Palestine, it must be noted that ‘peace’ is not security for Israel. Why should Israel give up a tactical advantage for a vague and nebulous promise of ‘peace?’ Beware the peacemaker because he may throw you into the jaws of the beast, just to purchase a little extra time for himself. Preparing for war is a far more effective guarantee of peace than signing pointless treaties or making concessions. But overall, this book is well worth your time. This wasn’t what I was planning to write, but it forced itself into my mind. I’ve been re-watching some of the early episodes of The Simpsons (the later seasons are largely unwatchable; I knew the show was doomed after the last Sideshow Bob episode stank worse than Love and Monsters) over the last few days and one of them – Two Cars in Every Garage and Three Eyes on Every Fish – reminded me why I have grown to detest Marge. But Marge isn’t the horror she grew into, in later seasons – not here. Marge is merely the idiot who doesn’t comprehend that free choice is sometimes an illusion. The basic plot of the episode is fairly simple. Mr. Burns decides to run for Governor. Homer unwillingly supports him – “Mary Bailey isn’t going to fire me if I don’t vote for her” – while Marge is insistent that the family should support Mary Bailey. Towards the end of the episode, Mr. Burns decides he needs to show the human touch by eating dinner with a ‘normal’ family – and picks the Simpsons. Marge refuses, at first, to have anything to do with it; “I’m going to be ringing doorbells for Mary Bailey that night.” When Homer begs, she pretends to agree – and then ruins the campaign. Which is good for Marge, isn’t it? But tell me … what choice did Homer have? Homer works for Burns. The Simpsons Family is utterly dependent on Homer’s paycheck. Is Homer in any position to refuse, when Burns demands that he host a ‘private’ dinner party? 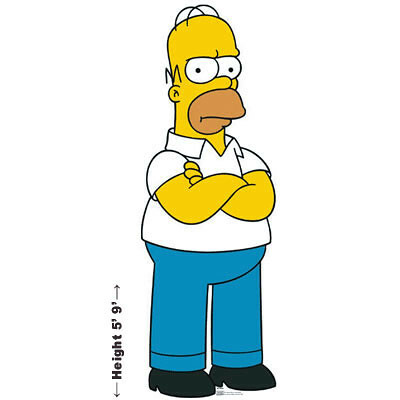 Does anyone really believe that Burns couldn’t or wouldn’t fire Homer if he refused to cooperate? (And do it in a way that would make it impossible for Homer to get another job.) Homer doesn’t have a choice – and he knows it (which goes to prove that Homer isn’t quite the idiot he’s supposed to be). Marge is the stupid person who’s prepared to ruin her family merely to make a political point. The thing about choice is that it is quite often constrained – and sometimes in ways you might not expect. Let me put forward the following scenario. There are two clothes shops in your town. One of them – Super Save – is cheap; the other – Wealthy Clothes – is expensive. A complete set of clothes for a single person can cost either £100 or £1000, depending on which one you choose. Here’s another fact. Super Save is cheap because the clothes are made in a third world country, where the workers are paid peanuts for their work; Wealthy Clothes is expensive because their products are made in your country, where there is such a thing as minimum wage laws. In fact, their expensive clothes are actually not priced to gorge the customer. They’re charging the bare minimum to keep themselves afloat. Imagine, for the sake of argument, that you’re on minimum wage yourself. Each month, you take home £1400. You have a family of four – yourself, your partner and two children. Which store do you shop at? I’d bet good money you’d go for Super Save. £200 over £4000 for your whole family? It’s a no-brainer. There are people who talk about making ‘ethical’ choices in shopping, about buying from firms that pay their employees a living wage rather than firms that exploit people in corrupt countries. And that requires that you have the freedom to make that choice without hurting yourself! Clothes from an ‘ethical’ firm might cost ten times as much as clothes from an ‘unethical’ firm. That ‘ethical’ coffee might cost twice as much as ‘non-ethical’ coffee. Recycled [whatever] may cost more than new [whatever]. Power from a wind farm may be far more expensive than power from a nuclear plant. And so on. And so on. All of those pennies add up, one by one. It’s easy to preach to people about how they should only use ‘ethical’ firms and purchase ‘sustainable’ goods. But I’d bet that most of the people doing the preaching aren’t actually paying for their own purchases. Because, if they were, they might understand why people make choices based on economics, rather than ethics.